I'm still reveling in the after glow of Team Canada's win against the U.S.A. on Sunday so here's my thoughts on the Waste Management Phoenix Open although a little late. Was really disappointed that Brandt Snedeker didn't win after shooting rounds of 66,67,66. Playing at 7 over par for Sunday isn't going to cut it unless everyone else is shooting that score. Was very surprising considering his finishes as of late (T10, T2, T20, T21). Having Hunter Mahan go low on the weekend with rounds of 65s was also a bit of surprise as his season hadn't been great up until Sunday (T27, cut, T64, T33) but he obviously wants to represent the USA again for the Ryder Cup so he was able to get things done. Once again was real impressed with Rickie Folwer and not only for his stylin' Puma apparel (see below post) but his finishing round 68. Should he of gone for it on the par 5 15th probably yes considering he didn't birdie it and lost by one stroke to Mahan. But he felt that was the right move and went for it. You have to like his play so far this season. It will be interesting to see how he does this week at the Honda Classic. I know a lot of guys here in the Ottawa area that are club hos (changing golf clubs left right and center) but it looks like there are some on the PGA Tour as well. Ryan Moore had a whole new bag last week according to Ari Techner the President/CEO of Scratch Golf. After rounds of 66 in the first and second rounds he was well on his for another victory but a 74 Saturday put a dent into that big time. 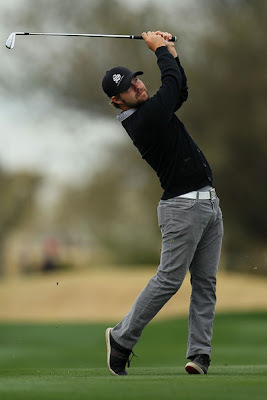 Nice to see him finish with a 68 and T14 in the tournament on Sunday though. Anthony Kim's season hasn't been great with finishes of T52, T33. Nice to see him not mail it on on Sunday after a third round of 76. He finished a respectable T24 after a fourth round 67.